This is my kitchen at Christmas. The shelves were finished yesterday. I didn’t waste any time filling them. And I added Christmas decor to the mix. I figure it is probably the only place Ivy can’t access. You can see my new kitchen sign I found at Tuesday Morning. I just had to bring that red beauty home with me. Yesterday I dug around in my tub searching for small holiday decor. Christmas decor is tucked in here and there on the shelves. Can you believe I have Christmas decor down to one plastic tub? When you live in an apartment with no attic or basement, it’s hard to store seasonal decor. You have to justify taking up space for just a month’s time. I think having the third 4 foot shelf helps to balance out the wall better. I liked it before. But I like it even better now. I found these red and white rose plates that one of you sent me four of years ago. I just love them. They are so feminine and of course red and white! One of you also sent me two battery operated candles. I’d never had them before. I have one here on the shelf. At night I use the remote to turn it on and the glow in the kitchen is just beautiful. Red and white is everywhere you look on my kitchen shelves. I tried to space the red and white decor out for a sense of balance. Aren’t the red and white rose plates lovely? While at Tuesday Morning on Saturday, I also found the two glass canisters with tight suction lids for my sugars. 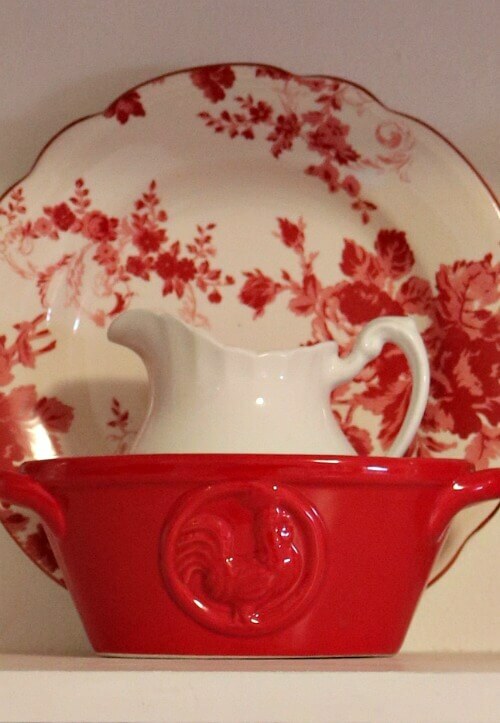 I also picked up the little red dish with the rooster. They had a set of red and glass kitchen canisters, with red chickens on top of the glass canisters, for $24.99. I was sorely tempted to get them. But I wasn’t sure where I’d put them. I’m so pleased to have my shelves. I don’t know where I’d be able to put breakable decor if I didn’t have them. Ivy hasn’t gotten on the kitchen cabinets yet, thank goodness. I’ve thought about putting one of my tabletop Christmas trees up in that red beverage stand I’ve used the past few years. But I can’t figure out quite where I’d put it. The obvious place is at the corner in the living room adjacent to my blue hutch with white dishes. But I’m afraid she might then be tempted to get on the blue hutch to get to it. And I will be heartbroken if my white dishes get broken. Here’s the candle turned on. It isn’t dark enough to show how pretty it is. But you get the idea. Oh, Brenda, everything looks lovely! I love everything and tucking the candles in was a brilliant idea (no pun intended LOL). I like the soft glow at night. I can’t use scented candles now due to Charlie’s health problems. I truly thought that red Kitchen sign had my name written all over it. Yes, I’ve had the polka dotted chickens for years. They were in my closet. I absolutely love your new shelves. Love how you decorated for Christmas and the farmhouse style. You were so good at decorating. I love red and white as well my kitchen is in apples. I have light green walls and a greenish counter top. Just as a sidenote my precious puppy died early this morning. She was 13 and had diabetes and Cushing’s disease. We managed the best we could. My heart is sad. I understand your grief. I laugh with happy thoughts of her and cry the next moment. Can’t eat or sleep right now. Oh no! I am so, so sorry for the loss of your beloved pet. Your kitchen looks so nice. I think you are an expert on small home designing. It’s not crowded but very warm and cozy. I love Ivy’s daily antics and Charley’s reaction to some of those antics. They just make me smile. I do love small home designing. It’s challenging sometimes. Brenda it looks wonderful. I really like the shelves and they give you more options for decorating now that hurricane Ivy is in the house. My Annie has sniffed the tree (artificial) ad just thinks its in her way and isn’t interested…but she is much older then Ivy! Love the kitchen sign, I do love red touches in a kitchen. You’re so right! With hurricane Ivy around, I have to be very careful where I put things. I love the red accents; so cheery! Yes, you have to think of Ivy Lou when placing anything that could be within her reach as you know she will have to investigate it. I envy you being down to one tub holding all Christmas. I got rid of one tub and going to continue to downsize as it feels so good and it gives me a nice feeling knowing that someone else can use what I no longer want. Happy Monday afternoon to you, Charlie and Ivy. I figured someone else will have more room than I have and could use what I don’t have room for, Carol and Molly. Everything looks so beautiful and inviting. Your new shelves are wonderful and so useful. 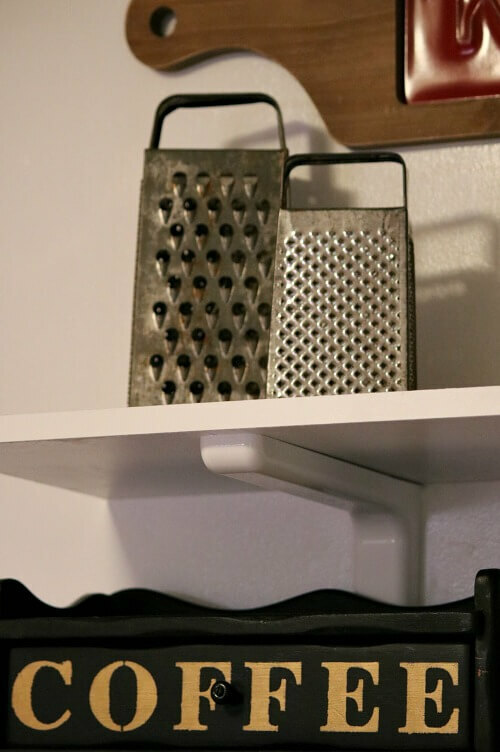 You have found so many ways to have more space to store items and also to display them. I think you are right not to put your plates where they might get broken. You will probably be able to put them in more places when Ivy is a little older. I use a lot of battery operated candles, too and I just love them. They look very “real” these days and are so much safer. I would never trust lighting real candles either. We’ll see how Ivy does as she gets older. 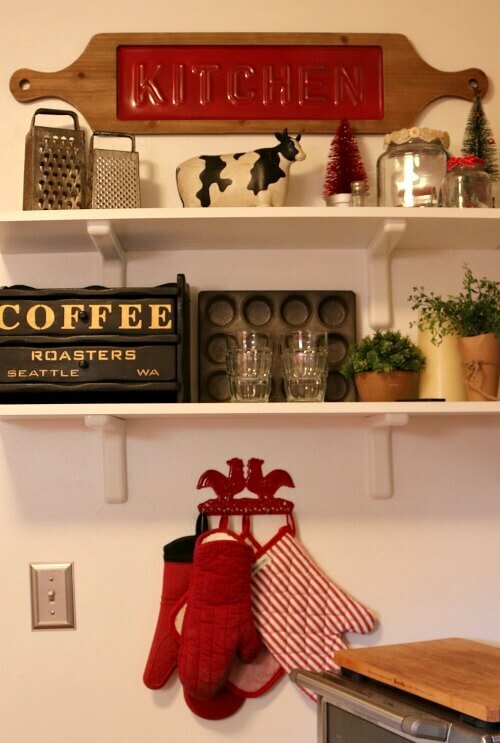 What a treat to see your kitchen shelves decorated…with your reds, they look especially festive. Since we are retired (and tired), we’ve downsized and, I too now have Christmas decor down to one large plastic crate. Fall had pinecones and evergreen cuttings plus small pumpkins on the mantle. Christmas/winter decor is evergreen cuttings, fairy lights, and white battery operated candles like yours a reader sent you. 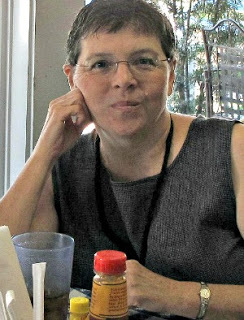 I so enjoy your blog, Brenda. I try to decorate with things from nature when I can. Nothing to store! Hi. I went back to a previous post to see what the kitchen looked like with two shelves on each wall. It looked fine, but it’s so much better with the extra shelf added. It’s fun to see some of your charming Christmas favorites displayed on these shelves. 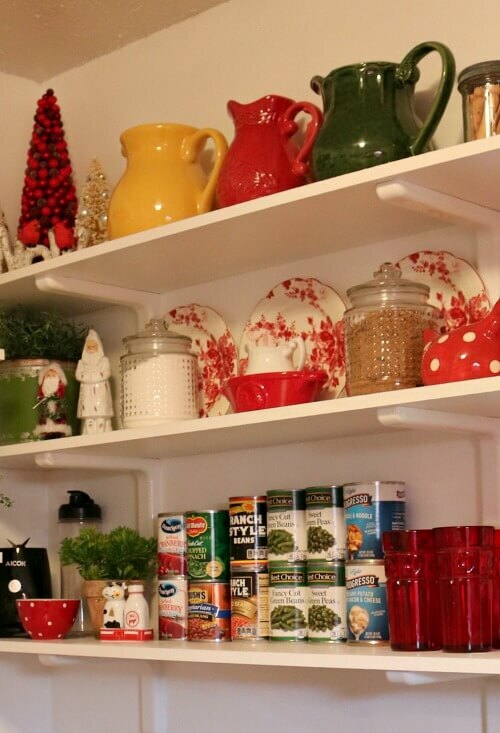 The canned goods mix right in with the decor! You will get so much use, and fun, out of your new shelves. That Kitchen sign is a great find. You might have to wait a year on putting a tree where Ivy could make an attempt to get to it. Our lazy cat probably wouldn’t be tempted, but Ivy certainly would be! I was excited because I knew it would give me a bit more room to put stuff! 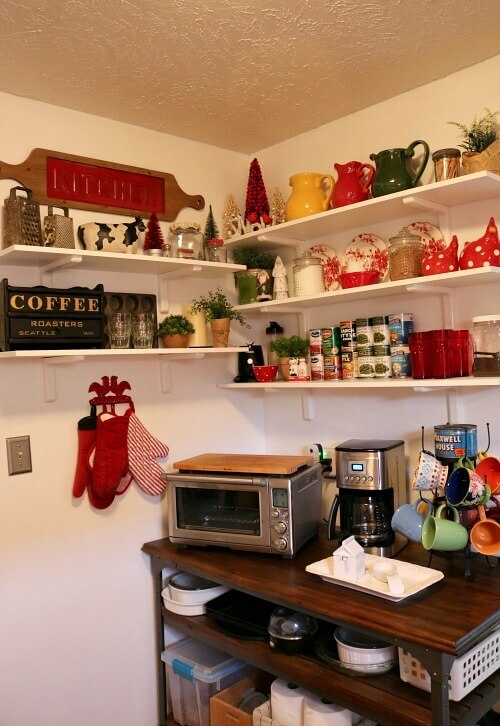 Love love love everything about your shelves, Christmas decorations, and the way you have everything setup Brenda! Nice! I really don’t end up buying much at Tuesday Morning. Often I just walk around and look. But occasionally I stumble across a really good deal. 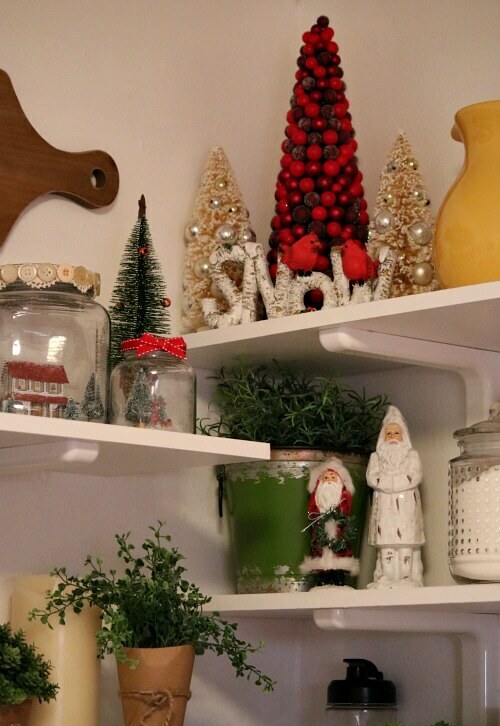 Can you store seasonal decor in Ivy’s closet? I have a rolling set of shelves in Ivy’s closet with painting supplies in them. No more room in there, I’m afraid. I know what you mean about homes looking like a craft store exploded. Just a bit too much for me. And much of the time, whatever is the trendy stuff tends to be in every home. It looks great, Brenda, just the right amount of Christmas to bring in some holiday cheer! Ivy forces me to decorate less. Maybe it’s a good thing. Kind of freeing really. Perfect! The fifth shelf makes it much better!! Love everything, especially the cow. Come decorate my house! I would if you lived near me. I’ve been trying to find a good spot for my cow. Brenda, you have done an excellent job decorating the shelves! 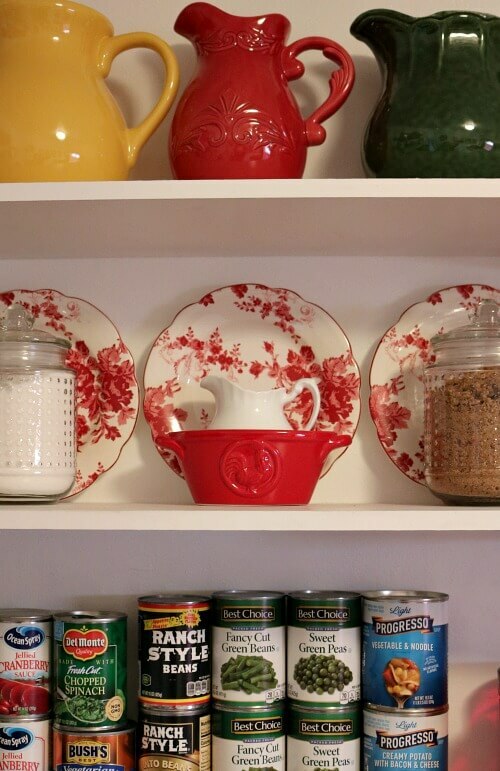 I love those red/white dishes and all the other touches of red. The greenery is a perfect balance…so pretty! Love and hugs! Thanks, Benita! Pets come first in this home. I love all the red accents. Especially the rose plates and the kitchen sign. Your place is so homey and cozy. I am envious of your new table and chairs too I simply have no room unless I get rid of my leather sofa (which I love) and reduce down to a loveseat. So I guess I will just have to go without. I have not decorated for Christmas yet this year, I am not in the mood yet. I wasn’t planning to get the Christmas decor out yet. But when he added the fifth shelf, I kind of wanted to put a few things out. I’ve considered having a loveseat. But when I’m tired or don’t feel good, I like to stretch out on my sofa. Your kitchen is just beautiful!! The third shelf was a great idea, and I do love your red and white theme. Your house is beginning to look a lot like Christmas! Red and white seems to be my go to color combination at Christmastime. I love everything you did ,the red and red and white is lovely .It all looks very festive .Perhaps you could try a small tree somewhere and see what happens .My kitty just looks at mine and never tries to get near it or jump on it but he is older than Miss Ivy Lou . It is beginning to look a lot like Christmas at your cozy lil house . I also love the shelves they were a great idea . Have a great rest of the day ! It all looks sooo nice . I love all the touch’s of red , my favorite color also . Forthelast 30 years I’ve had one or two indoor cats , none ever really bothered the tree . I hang jingle bells around the bottom, not so much for decoration as alarms ! My cat , Gert will swat at them a bit . If you choose to try this be prepared sometimes at night while I’m in bed I can here him and then I holler. It’s the only ornament he’s ever bothered . I think he likes the noise so he swats them . I love it, you always make the best use of your space. Beautiful, Brenda! You know I adore all of your red touches and those battery candles are my all time favorites…they really do add so much. Enjoy your new view! Brenda you are so right adding the extra shelf makes everything better and balanced. Great find in your new kitchen sign. I like it. 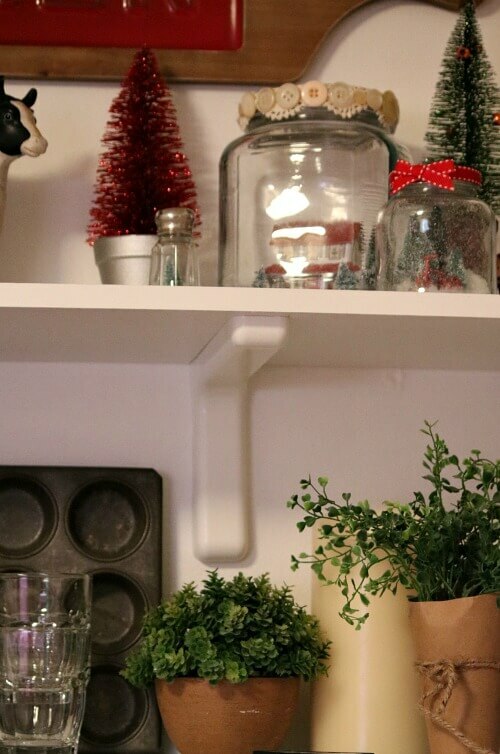 Your kitchen looks so festive and lovely. It all looks very pretty and festive! 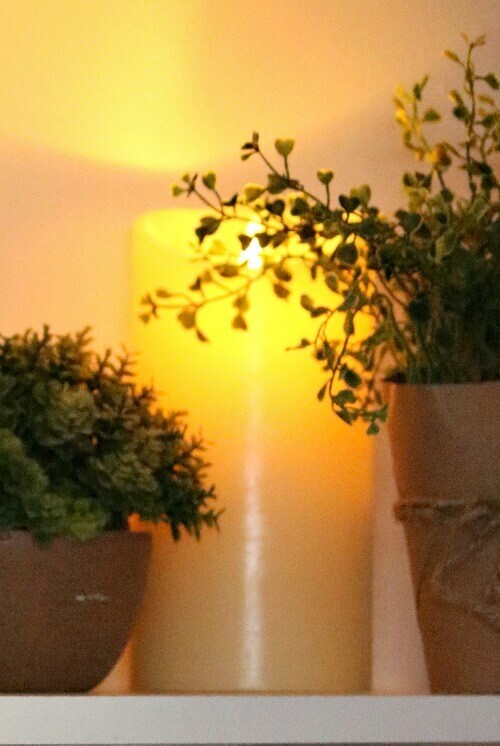 Love the soft glow candle too. You’d be surprised at where those kitties can get! So beware! I have a very tall hutch that is almost the height of my ceiling, maybe -7-1/2 feet, and on top are two big baskets and not hardly any “ledge” to walk on… but my female cat, Maddie, manages to jump up there from the windowsill (which is a foot away and at a weird angle) to the top of that hutch, and sit on the very edge of about 3 inches of space! When I first saw her up there, I was flabbergasted! She’s a very high jumper and can land on a very small space. So beware is all I can say! She and our male can also jump up on my china cabinet that has a lamp, china vases and odds and ends, and manage to walk along the 2 inch edge without knocking anything off! They have magic feet! Good evening! Everything looks beautiful! I love it all. The pops of red are wonderful! Things look great! You have an eye for arranging things. I wish I could do my home like you do. Love the red, it is a favorite of mine too. Give Charlie and Ivy some extra love today. They are so entertaining! Wow, it looks wonderful! I love the row of pitchers, and the rose plates are so pretty. I’m glad you mentioned the battery candles, i.e., why didn’t I think of that. With the long nights now, the soft glow lighting up the dark corners feels so much warmer. Oh, my gosh, Brenda! Your shelves look gorgeous! Such a happy-looking corner! And, you’re right about the fifth shelf balancing things out. I tho’t that myself before reading your comment. It’s that old art thing about odd numbers displaying more appealing than evens. Your new kitchen sign is great. Is the red sign attached to the wooden cutting board(s)? 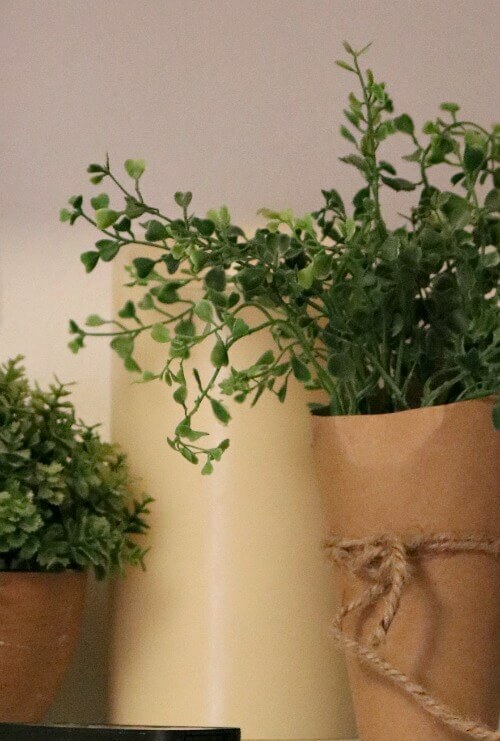 I love the candle tucked in sort of behind the plant and on the shelf with the canned goods you have a small cow next to another small object that I can’t tell it’s identity. Anyway, that is the cutest cow. 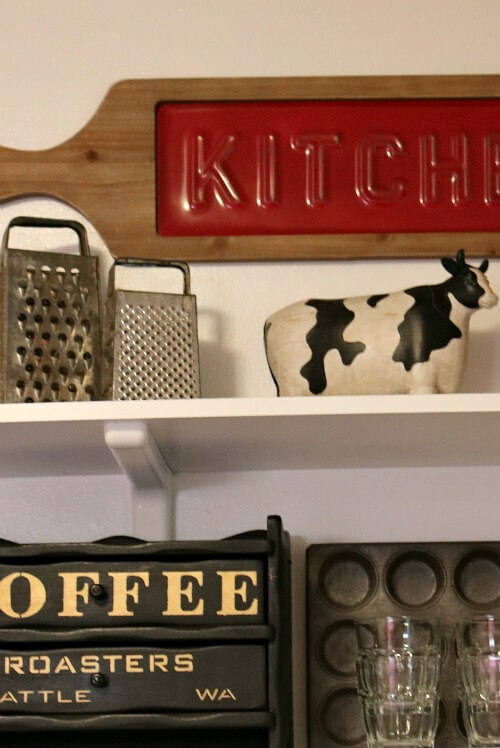 And, of course, I’ve always loved the cow on the top shelf under the KITCHEN sign. 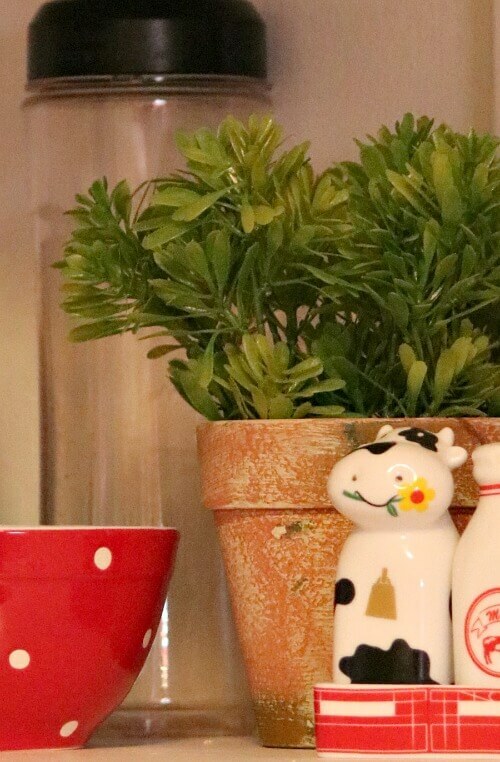 Oh, now, scrolling back up I see that the little cow is next to a little bottle of milk and they are salt and peppers. So cute! Now, if that little mischief, Ivy is able to get far enough up to reach any of those shelves I will eat my hat! I think you have foiled her for sure, but….? I said yesterday how I was looking forward to my solitude today as everyone would be back at school and work. Ha, ha–it snowed and the boys had a snow day and my daughter stayed home from work! Foiled again! Maybe tomorrow. Don’t know if we are supposed to get more snow tonight or not. I haven’t put up any Christmas decorations yet. My youngest daughter’s birthday is Dec. 6 and traditionally, we never put up Christmas decor until after we celebrate her birthday. So I have a bit of a reprieve although I think I may try to get the wreath on the front door. Everything is covered with white here and I believe it is going to stick for awhile. I can’t deny that Winter is really here anymore! Waaaah! Thanks for the great shelf reveal today. Don’t know what your weather is out there but stay warm, the three of you. Hugs and pats! Your Christmas decor is very pretty and you’ve done well to keep it all to one tub. love it! the 4th shelf is just perfect. Your Kitchen is so beautiful. I love your new shelves and you have placed everything so perfect. The red sign and red and white dishes are just perfect, Looks like Christmas has popped out all over. Love the candle also. I have a set of 3 candles that my daughter gave me a few years ago and I use them in some way every Christmas. I love your cozy little home. It just gives me a happy sigh looking at your pictures.